LAS VEGAS — Kyle Busch got his hometown weekend, and his attempt at a third-career tripleheader weekend sweep, off to a flying start on Friday evening by capturing the pole for the Stratosphere 200 at Las Vegas Motor Speedway. The Las Vegas native toured the 1.5-mile oval in 30.575 seconds (176.615 mph) during his second-round run, placing the No. 51 Cessna/Beechcraft Toyota Tundra out front of the field for the first time at his home race track. Busch has not competed at Las Vegas in a truck since his very first year in the series in 2001, when he was driving for Jack Roush and finished ninth in just his sixth-career start. His pole effort on Friday was the 20th of his Truck Series career, and he led both rounds of qualifying in the process. Starting alongside Busch will be Canadian Stewart Friesen, who posted the second-fastest lap (30.597/176.488) in his No. 52 We Build America Chevrolet Silverado and will roll off from the front row, marking his best-career qualifying effort on an asphalt track in the Truck Series. 2016 champion Johnny Sauter earned the third spot on the grid, followed by two Kyle Busch Motorsports young guns in Spencer Davis and Noah Gragson. Atlanta winner Brett Moffitt, Justin Marks, Grant Enfinger, John Hunter Nemechek, Myatt Snider, Justin Haley and Matt Crafton filled out the first six rows on the grid and all advanced through both rounds of knockout qualifying. Austin Hill was the first driver below the cut line at the end of round one, posting a time of 31.044 seconds (173.947 mph), and will start 13th as a result in his No. 02 United Rentals Chevrolet. 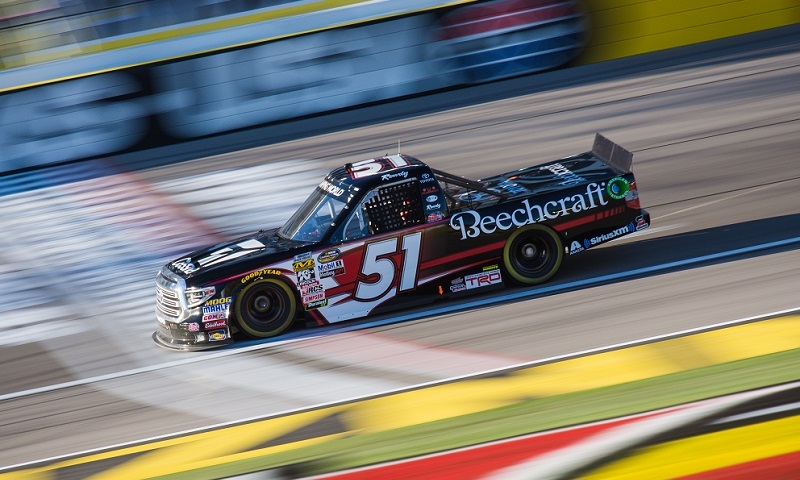 Other notables who failed to move on from the first round included defending Las Vegas Truck winner Ben Rhodes (15th), Jordan Anderson (16th), Dalton Sargeant (18th) and Joe Nemechek (21st). The Stratosphere 200 takes the green flag at 9 p.m. ET Friday night, live on FOX Sports 1, the Motor Racing Network and SiriusXM NASCAR Radio, channel 90.